Description: Create a TodaysMeet activity for your students to use in a way that will enhance instruction and communication. 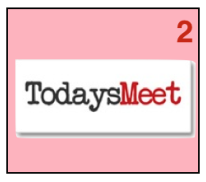 TodaysMeet is a microblogging backchannel that empowers classroom teachers to generate a discussion without the interference of raised hands or student disruptions. What is a backchannel? Backchanneling is having real time online conversations alongside live presentations. A backchannel lets participants ask questions, discuss what is being presented, share links and reflect on their learning. Backchanneling could be describe as “virtual whispering or note passing” during lessons, presentation or activities. Thank you to Cynthia Treichler for much of the information on this page. Cynthia Treichler is a high school social studies teacher and instructional technology professional development facilitator in the Prince William County Schools. She is also the instructor of the Project Based Learning Course in the Wilkes/Discovery Masters program. What are the major benefits of TodaysMeet? Similar to Twitter or Edmodo; featuring a 140-character limit and an easy-to-use interface. It’s a backchannel, which helps teachers conduct online discussions while channeling the results onto one web page and displaying it on the SMART Board. No accounts or passwords are needed for students to use TodaysMeet. Students can participate using any device with internet access including: computers; smartphones; ipads; ipod touches; tablets. Use TodaysMeet as a parking lot for questions that come up during the lesson. Watch a video, and instead of stopping at various intervals to discuss students’ reactions and questions, use the backchannel to allow students to record their reactions to what they see. At the same time, it will give you the opportunity to answer questions that arise as they watch the video (Source: FreeTech4Teachers.com). Take the transcript from the discussions after a lesson and put them in Wordle. See what they are talking about (the biggest words are the ones used most often – you will see what students are participating the most in the conversations). Collaborate with another teacher to have two or more classrooms engage in a conversation by listening to the same content at the same time. After students finish an activity, have them record their responses to the activity in TodaysMeet. Before a science lab, have students record their hypothesis. After the lab, have students share their conclusion. Have a silent discussion after reading a specific text. Compliment a lecture – have students write questions and comments as they pop into their heads. 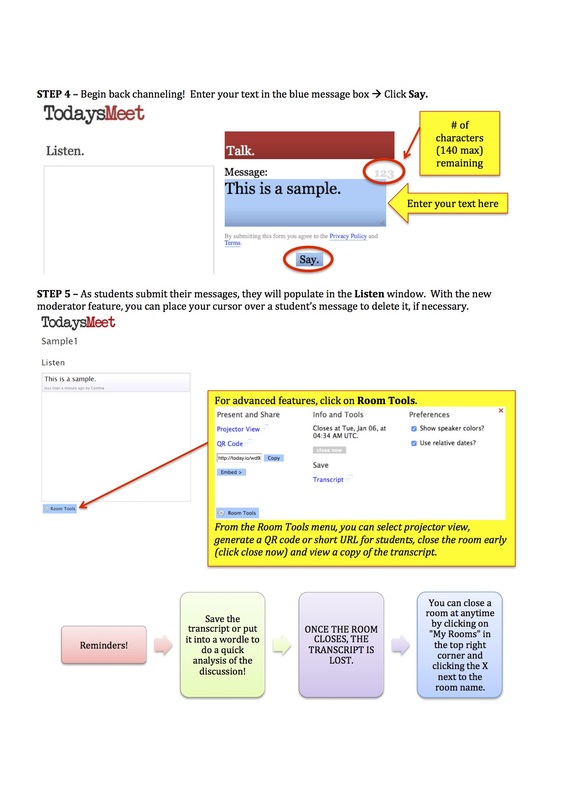 This will enable more students to ask more questions and share more comments than if they all had to raise their hands and wait to be called upon (Source: FreeTech4Teachers.com). Click here for additional integration ideas. This first image is from a great read about how an English teacher uses it in his classroom. Click here to read more! Here is a great example of an AMAZING conversation by our very own Abingdon 5th Graders (a few years ago) during Tech Wheel with Paige Whelan. Richard Byrne (Free Technology for Teachers) created a terrific guide to backchanneling and informal assessment that features Socrative, TodaysMeet, and Padlet. Click here to view the document. The document contains ideas and tutorials for using each tool. How else do you think this could be used in the classroom? Add your thoughts to this TodaysMeet Chat. Create a TodaysMeet Activity for your students to use in a way that will enhance instruction and communication. 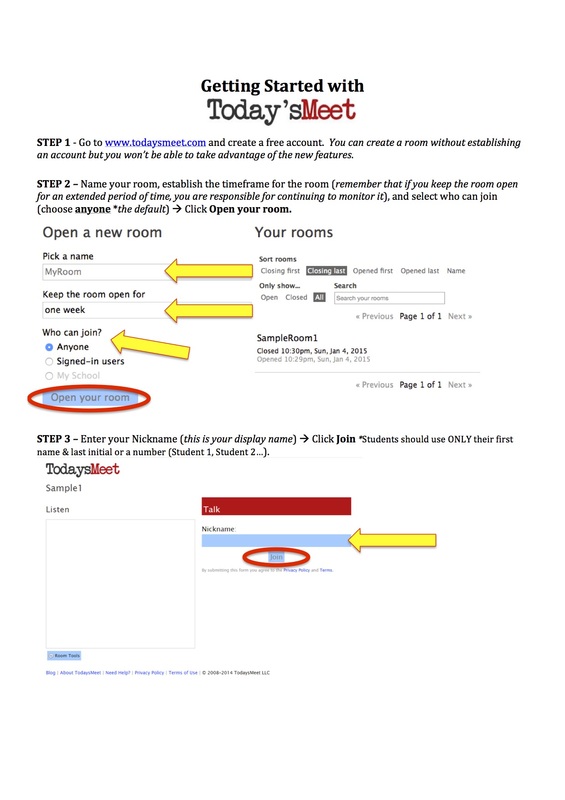 Integrate TodaysMeet into a lesson. Make sure that your students have the opportunity to respond to each other’s posts with words like “I agree with ___ because ___” OR “I disagree with ___ because ____”. Submit a “Reflections After PD” Blog.